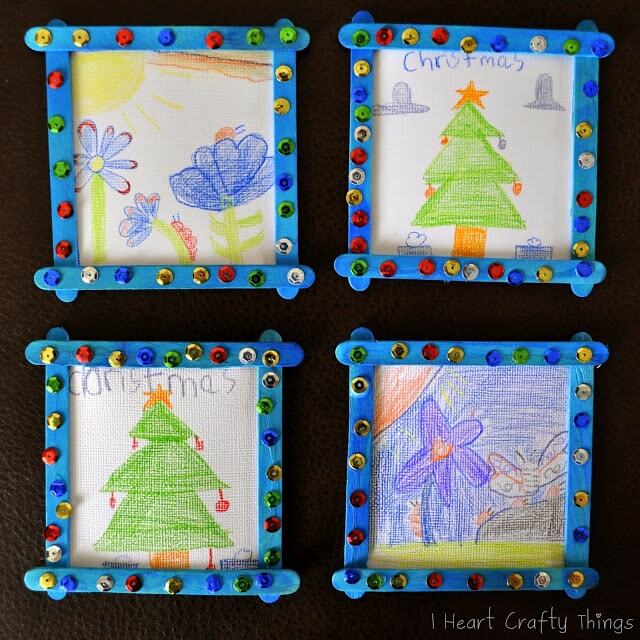 We decided we wanted to make some homemade gifts for Grandparents this year for Christmas and came up with these darling little framed art pictures. We glued magnets on the back of them so they can hang on display on the refrigerator. I love how the brightly colored frames make the artwork pop out. 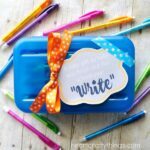 They are only about 4″ x 4″ so they are as cute as can be! My three year old had mostly scribbles to add to her canvases, but they are beautiful and I know Grandparents will love them! 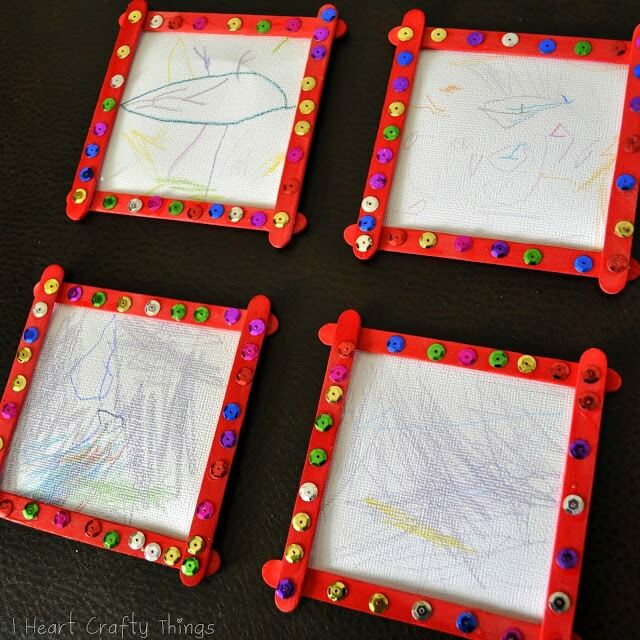 The secret to the fun frames is these Colored Craft Sticks from our friends at Craftprojectideas.com. They come in a pack of 150 sticks and are brightly colored red, green, blue and yellow. You can purchase them at your local Walmart in the arts and crafts section. 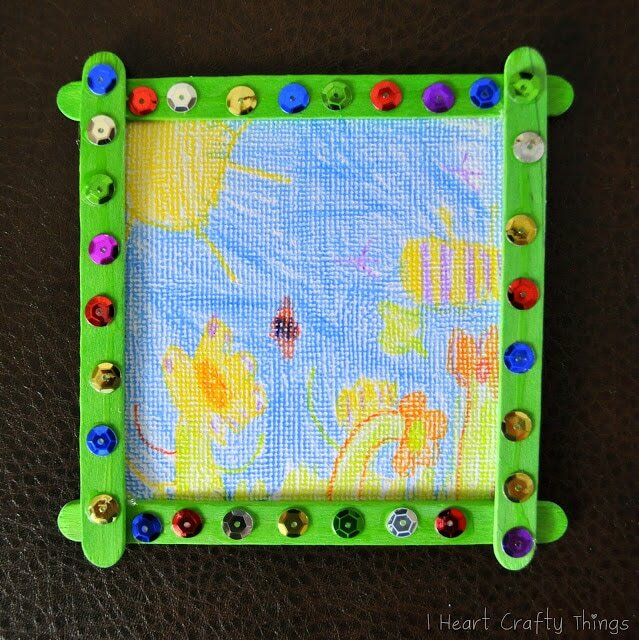 To make the frames I hot glued four of the craft sticks together in a square. (*This step needs to be done by an adult since the hot glue can burn children.) 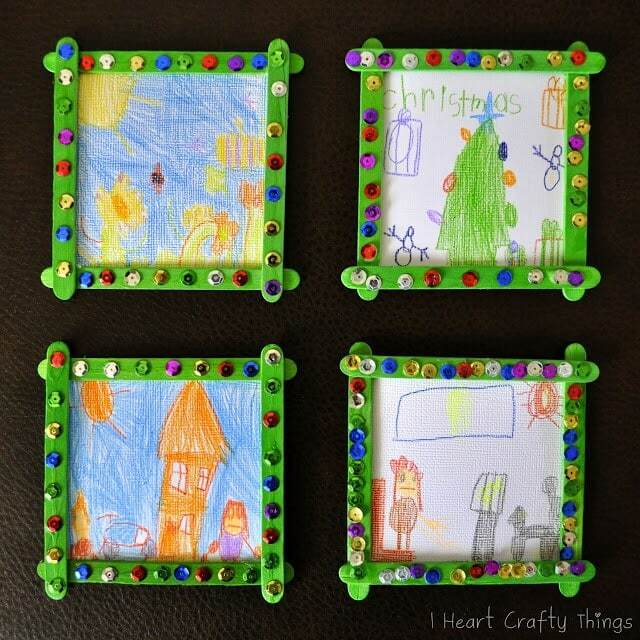 Then my kids had fun decorating their frames by gluing sequins all over them. While the frames were drying, I cut out our canvases out of white cardstock paper. I made them 3 3/4″ x 3 3/4″ squares. 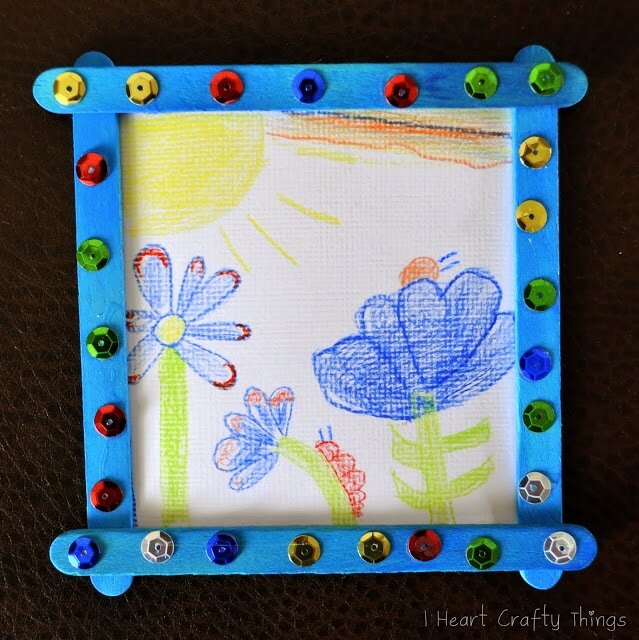 My kids used colored pencils to draw and color to their heart’s content and once the frames were dry, I hot glued the artwork to the back of the frame, making sure the picture showed through the front of the frame. 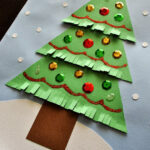 Then I glued a magnet on the back and voila! A beautiful masterpiece perfect for a Grandparent gift…AND perfect for a family on a Christmas budget too! 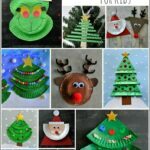 🙂 Do you enjoy making homemade gifts for Christmas? 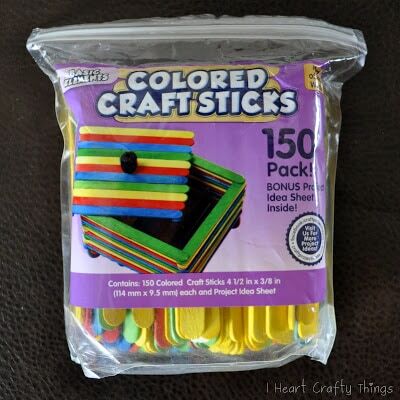 **I received my Colored Craft Sticks for free from Craftprojectideas.com but all opinions expressed are 100% my own. I love these!! Your kids are so talented. I'm sure the grandparents will cherish them forever!